You’ve probably heard that starting March 6th, the sun will experience active solar flares. This will be the most flares since 2006, but likely not the most volatile flares in the current solar cycle. We are in solar cycle 24, which is predicted to have the lowest solar peak since 1928. A solar peak is the highest number of sun spots during a solar cycle. And a solar cycle is a cycle of magnetic activity on the sun — which is usually about 11 years long, but can range between 9 and 14 years. The first recorded solar cycle was in 1755, so we’ve been counting cycles since then. So, as solar flares go, this is an exciting time, but nothing to get over-excited about. Of course, that hasn’t stopped some wack-a-doos from making doomsday predictions. But I won’t get into how redonkulous I think those people are being (well, I won’t get into that again). Can I just say that NASA is da bomb? * I rely on their site for all of my astronomical information and they do a great job of providing educational material that is accurate and easy (well, as easy as possible) to digest. They have a terrific Q&A page on solar flares, too. And NASA doesn’t think the world is going to end this year, either. The ancient cultures of Mexico also had several sun gods. The Aztecs worshipped Huitzilopochtli (also spelled Uitzilopochtli) as their sun god and he was also the god of war and human sacrifice and a legendary wizard. Kinich Ahau was worshipped as the sun god in Mayan civilization and was also associated with music and poetry. He is usually shown with jaguar-like features, such as pointed teeth. Inti was the sun god and patron deity of the Inca. He was the source of warmth and light, a protector, and a sort of father to the Inca Emperors (as they were believed to be the lineal descendants of Inti). A bas-relief from the Roman Baths at Aqua Sulis in Bath, England. The reconstructed Irish deity for the sun is Lugh, who is represented in mythological texts as a hero and king. Legend has it Lugh was born unto the Tuatha Dé Danann clan (sound familiar? think “Willow”). 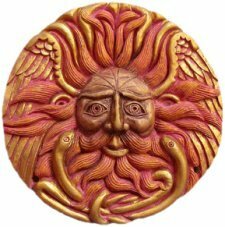 It wasn’t until Victorian times that Lugh became fully associated with the sun because the root of his name was thought to mean “flashing light.” The Celtic harvest festival of Lughnasadh is named in his honor. Belenus was the a sun god of the Celts and his name is thought to mean “bright” or “brilliant.” He was also a healer and associated with healing springs and the healing power of the Sun. The fire festival of Beltane (also known as May Day) was probably related to Belenus. He was considered very much like Helios and Apollo because he was a god of light and healing. His icon if often incorrectly labeled as a “Gorgon’s head” or a “male medusa,” but his mask showed flaming solar rays emanating from his hair and beard (though he was garlanded with serpents) and he had wings. Sulis was a goddess local to Bath, England who had strong solar connections. While the Indo-European root of her name means “sun,” that is not the exclusive translation of her name. Her name may also be associated with the Suleviae or with the underworld. 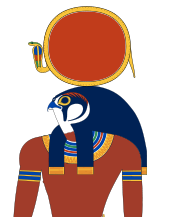 Ra as the head of a falcon and the sun-disk resting on his head. There seems to be one major sun deity in ancient Egypt, Ra. But he was known by several names across time and place in Egypt: Ra, Amun, Amun-Ra, Atum, Atum-Ra, Horus, Khepri and Khnum. The meaning of Ra has not been definitively determined, but it may mean “sun” or it may mean “creator” or “creative power.” Ra traveled on twoboats on his journey through the sky to the underworld, the morning boat and the evening boat. His most common forms were as a man with the head of a hawk and a solar disk on top, a man with the head of a beetle (in his form as Khepri), or a man with the head of a ram. But Ra also shows up in iconography as a ram, beetle, phoenix, heron, serpent, bull, cat, or lion. 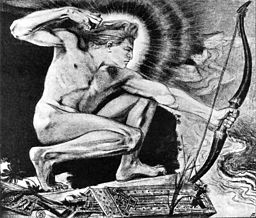 Pencil sketch of Apollo by Stanisław Wyspiański (1897). Some of the most well known sun gods were part of Greek and Roman worship in antiquity. There are several sun gods in these patheons. Helios was also known as Titan or Hyperion and was brother to the goddesses Selene, the moon, and Eos, the dawn. Together, the siblings made the sun, the moon and the dawn. Helios morphed into Sol Invictus under the rule of Julian the Apostate in the later Roman period and was named the one true god during Julian’s reign. The Grecian Apollo was recognized as more than the god of the sun. He was also the god of truth and prophecy, healing, plague, music, and poetry. And he was the son of Zeus and Leto, and brother to the huntress Artemis. The primary solar deity in ancient and modern Hinduism is Surya. His hair and arms are made of gold and he rides through heaven in a chariot harnessed by seven horses (or possibly one horse with seven heads) which represent the seven colors of the rainbow or the seven chakras. 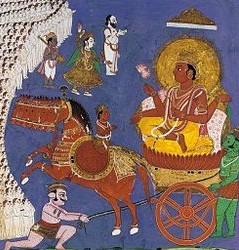 A well-known devotional movement to Surya known asSūrya namaskāra. If you do yoga, you know this in English as a sun salutation. In Vedic astrology Surya is associated with the soul, the eyes, general vitality, courage, and highly placed persons and authority. He is also considered a mild malefic (bad boy) because of his hot, dry nature. 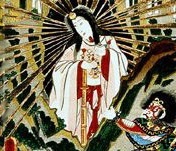 Painting of Amaterasu emerging from a Cave (1857). The goddess of the sun and of the universe in modern Shinto religion and ancient Japanese myth is Amaterasu. Her name comes from Amateru, which means “shining in heaven.” Amaterasu was first found in Japanese texts dating back to circa the 8th century. She was born from the left eye of a deity of seven divine generations. Amaterasu became the ruler of the sun and the heavens along with her brother, Tsukuyomi, the god of the moon and ruler of the night. She has a sacred shrine in Honshū, Japan that houses her sacred mirror, Yata no Kagami, which represents wisom. Every 20 years (possibly since the 690s), a Shinto ceremony is still held to honor Amaterasu. "The Wolves Pursuing Sol and Mani" by J. C. Dollman (1909). The sun goddess in the Heathen pantheon is Sól, also know as Sunna (in Old High German). In the Eddas, she is sister to the male-personified moon, Máni, and is foretold to be killed by the monstrous wolf Fenrir during the events of Ragnarök. 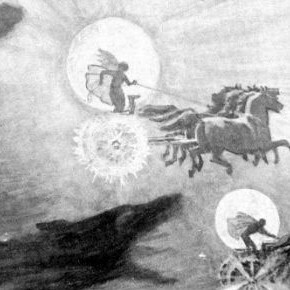 Every day, Sól rides through the sky on her chariot, pulled by the two horses Arvak and Alsvid. Alsvid means “all swift” and Arvak means “early riser” and below their shoulder-blades the gods inserted iron-cold bellows to keep the horses cool. Sunna and Máni are chased by wolves who try to devour them as they ride across the sky. She is pursued during the daytime by Skoll by day and her brother is chased by Hati at night. There are more wonderful sun stories out there, but I limited the stories here to ones where I could find multiple citations. I found these two sites to be helpful: Windows to the Universe and Ancient History (on about.com) and they have more stories to share on sun worship. What do you think, Realm? Is the sun historically hot stuff or what?! The spring equinox is just around the corner and the sun will share equal time with moon. How does your tradition view and celebrate the sun? ** Uh…that sounds way more….umm…climax-ey than I intended. But that’s really what happens! + Featured image is of energy leaving the sun’s surface and was photographed using a coronograph at National Solar Observatory east of Alamogordo in Sunspot, N.M. Solar flares are the largest explosions in this solar system. I love the idea of using science to find more ways to connect with/worship our dieties. We will never find out exactly what rituals the ancient heathens did, and those rituals probably wouldn’t have much connection to our modern lives (except in very basic ways) anyways. 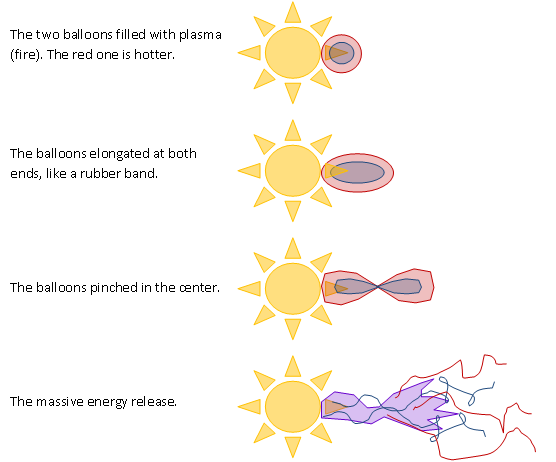 But taking the knowledge and understanding of solar flares and magnetic storms to connect with solar or magnatizing dieties is great! The Valkeries were said to come in the form of the Arura Borealis, and their queen is Freya (according to some… I’m not sure). This is an opportune moment to think of fallen soldiers, or people fighting for a worthy cause. Can you imagine doing a ritual right under the Aurora Borealis augmented by this storm? That’d be something! Another well written and thought provoking article. Thanks so much! Hi D’Har! I’m glad you like the post. I thought about including some Aurora Borealis stories here, but I ran out of room. This site as some great stories, http://www.auroraexperience.com/Default.asp?Page=249, including the Valkyrie. The Norse myth holds Northern Lights are reflections of the Valkyries’ shields as they ride across the sky bearing slain warriors to their heroic resting place in Valhalla. Cool, huh? The princesses do not have an organized plan for spring equinox this year. Indeed, we are both expecting a lot of change in our personal lives this year, so we are really only planning a party for our second anniversary (we think). But we may try to do something casual for Walpurgisnacht, too (http://www.paganprincesses.com/walpurgis-night-the-other-beltane/). If you are in Austin, check out Tejas Web or Yew Grove (at the UU Church). Both of those groups hold regular observances on Pagan holidays. This is a great post and overview of ancient solar deities. The scientific angle is great and the deeper you get into solar science and cosmology the more comfortably it fits with the mindset that views our Sun as a conscious entity with divine status. 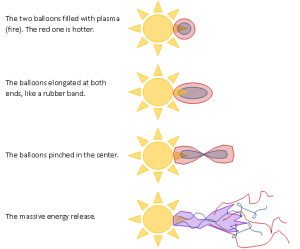 Sun and other stars sure behave like energetic beings. My book Sun of gOd, with a foreword by Graham Hancock, looks at the ancient idea of a conscious Sun in the light of current science and the implications are inescapable. It’s time to bring the Sun back out of the closet to which the early Christians banished it. Stellar consciousness is the missing piece in the cosmic jigsaw.